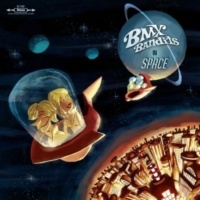 Duglas T. Stewart's BMX Bandits return with BMX Bandits In Space, their 10th or so studio album which reunites Stewart with erstwhile original members alongside collaborations with the Japanese group Plectrum and the London based Argentine musician Cineplexx. With Jim McCulloch (of Snowgoose) recalled from the early days of the BMX Bandits as key co-songwriter, together with Lenzie Moss's Finlay MacDonald and Teenage Fanclub's Norman Blake, alongside now regular mainstays Rachel Allison and David Scott, BMX Bandits In Space looks backwards as well as forwards. BMX Bandits In Space plays out as a space pop opera, with Duglas T. Stewart as astronaut beaming back transmissions. Original member and ex-Soup Dragon, Sean Dickson returns to provide the space age intro and outro, with the introductory track, 'In Space', encapsulating the essence of the BMX Bandits in the lines "When there's love there's hope". As previous BMX Bandits attest, Stewart is an incurable romantic tirelessly singing of love, beauty and music. And, in that respect, BMX Bandits In Space is no different. The electronic treatments carry over from the 'Into Space' introduction into 'Still' a tender ballad sprinkled with slight electro touches written with Plectrum. While the story board lyrics of 'Beautiful Friend' which touch upon drawings and drinking tea and a Belle and Sebastian performance might smack of tweeness the music plays out as a stylish soul track shot through with David Scott's chiming piano chords, cast around male and female harmonies. You'd be hard pressed to recognise the group still foolishly tarred by C86 and its shambolic musicianship. That comparison that hangs around the BMX Bandits is just so wrong. The BMX Bandits, as found on BMX Bandits In Space, as well as on most of their output since the nineties are an accomplished and sophisticated unit, marshalled around the unique lovelorn vision of Duglas T. Stewart. 'Look At You, Look At Me', the first of their collaborations with Cineplexx, captures the dreamy aura of a fifties pop single, with its lilting melody built around a boy/girl approach, sung by Bandits vocalists Duglas and Rachel. 'Elegant Love', the other track with Cineplexx, is a fresh take of 'Elegant Lines' from Bee Stings refashioned into a more agreeable elegant electro soul arrangement with its tale of unrequited love, with Rachel stonewalling Duglas's hopeful approaches. Duglas, as we well know, has a habit of finding love with the wrong girl. It's an unfortunate predicament for him, but something of a blessing for the ardent BMX Bandits listener. I've always loved the way the BMX Bandits incorporate their love of classic pop songwriting. And you can find it in the melting soul groove of 'Like The Morning Sun' sung beautifully by Rachel which picks up on The Carpenters in the lyrics "we've only just begun". 'Stewart has an unimpeachable knowledge of pop music from over the decades which he brings to the compositions, and he's not afraid to share his passions. It's no more apparent than on 'Listen To Some Music'. With a nod in the title to the Beach Boys 'Add Some Music To Your Day', it references classic songs penned by songwriters Hal David and Burt Bacharach, and Brian Wilson and Tony Asher that have influenced Duglas in his own compositions. This paean to the healing power of music carries with it a wonderful trombone score set around a classic Bandits melody. The simple C86 melodies (minus handclaps though) are refreshed on 'And It's You' here performed supremely in an brazen recollection of a failed relationship with Duglas the starryeyed lover unable, as ever, to let go. 'All Around The World' unites the varied strands that inform the sound of the BMX Bandits: meshing the girly pop songwriting of Bee Stings to the more typical sound of the BMX Bandits as found on any of their albums from the nineties. With Duglas and Rachel sharing the vocal duties it is a seekers song with a wry sneaky nod to 'Under The Moon of Love' in the lines "come on little darling take my hand". Elsewhere there are number of quiet gems such as 'Fireworks' (an archetypal BMX Bandits song filled with humour and heartbreak written by TeenCanteen's Carla Easton), the unflinchingly honest 'Fucked Up This Time' and the endearing waltz of 'And While We're Dancing', with quietly affecting hushed voices drenched in violins. 'The Unforgiven' returns to the space theme and it's a beauty. With Duglas's fragile tones straining over a sombre piano score and acoustic guitar; it's an uplifting moment performed as a hymn to love. This one is destined to become an enduring highpoint in the BMX Bandits career.